A long, long time ago in a galaxy far away (well, Hollywood) George Lucas turned the world of film on its head when he made Star Wars. Now, 35 years since Episode IV: A New Hope, it looks as though he may have done it again. After several years of internet-forum whispers and fanboy speculation, it was finally confirmed on Tuesday 30th October 2012: there will be more Star Wars films. The announcement was made by Lucas himself and revealed that his production company, Lucasfilm had been purchased by Walt Disney Studios. The company changed hands for a staggering $4.05 billion, which reportedly will be paid half in cash and half in Disney stock shares. As far as retirement plans go, George Lucas has a pretty good one! Focusing on Disney, the purchase marks yet another high profile takeover by Bob Iger in his time as CEO. Since taking the hot seat at Disney, Iger has overseen the acquisitions of animation supremoes Pixar in 2006, and comic book giants Marvel in 2009. 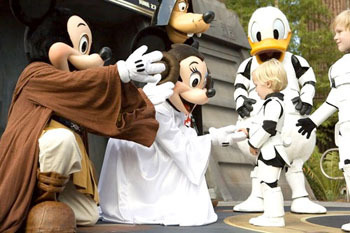 Now with Lucasfilm in 2012, it will be interesting to see who Iger sets his sights on in another 3 years, (Hogwarts? Middle Earth? Nothing would surprise after this!). So what does it mean for the most successful science fiction franchise of all time? Well, Disney and Iger didn't waste any time in announcing a trilogy on its way, with Episode VII expected for 2015.This of course means that in terms of a timeline, the new film should pick up the story after the events of Return of the Jedi. Fans among you will have no doubt noticed the peculiar effect this will have on the chronology of the series, with the original (and best) films now looking even more dated as they are sandwiched between the more recent prequels and the new Disney films. The new trilogy will no doubt feature a brand new array of characters, although I would not be shocked to see everyone’s favourite droids, R2-D2 and C-3PO crop up. Who knows, perhaps Mark Hamill might even reprise his role as Luke Skywalker, operating as a Jedi mentor to the series’ new hero. Plus we all know Harrison Ford isn’t above replaying his most famous characters, although if it is going to turn out anything like Indiana Jones and the Kingdom of the Crystal Skull, perhaps it would best if he stayed away. Through all the speculation and guess-work, one thing is absolutely certain: whether it recaptures the heights of The Empire Strikes Back, or is as bum-numbingly boring as Attack of The Clones, it will be the biggest film event in the galaxy.